Christa strutting her stuff as a 50s pin up model. Reader Christa has been chipping away at her labor of love house for a while now, collecting treasures along the way to make it her own. With a degree as an interior designer and years working as a kitchen and bath designer, you’d expect some creative mojo going on in her house. 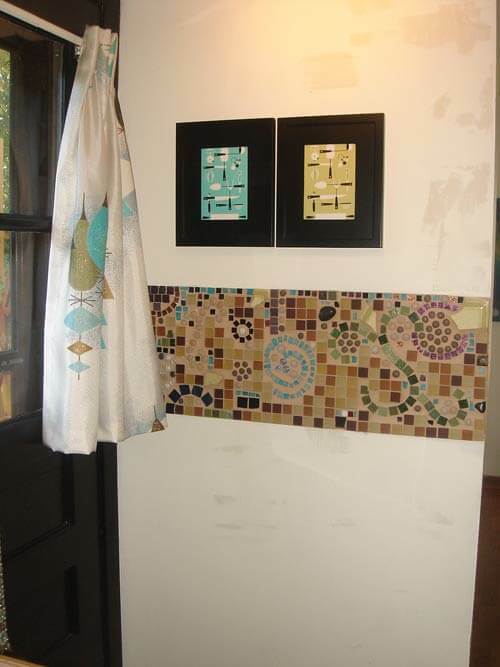 Yup: Using her designer’s eye and playful personality, Christa used her collection of discontinued tile samples to create one of the most creative mosaic back splashes ever. 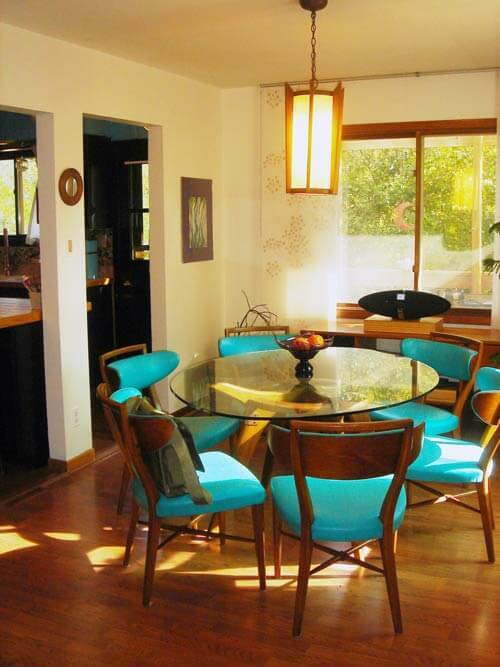 It’s part of her artistic, eclectic 1972 house, which includes fantastic Adrian Pearsall furniture, a Cado wall system, cork flooring found for 50 cents a tile, and lots of great collectibles purchased before mid century design began to boom. …meaning “one who eats from others’ plates”. Pique assiette is a style of mosaic that incorporates pieces of broken ceramics—plates, dishes, cups, tiles—and other found objects into the design. The appeal and expressiveness of pique assiette lies in the ideas of lateral thinking, humour, recycling, and the significance of the found objects. The house was built in “72 (or “74 there seems to be differing info that I have dug up), and the previous owner was the original owner. In the late ’80’s/early ’90’s he decided that pastel Southwestern was the way to go (you remember pink, and blue and yellow pastel cacti and Indians and such). 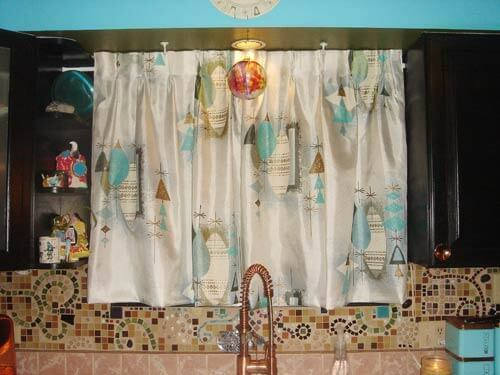 So when we moved in (in 2000) every room was wallpapered, and the cabinets were frosted maple, which had yellowed into a weird pinkish/yellowish color. He had painted the woodwork pink as well. Since we moved in, the wallpaper has been stripped (I know you adore it Pam, but I have a habit of repainting when I get bored..and wallpaper makes that hard). 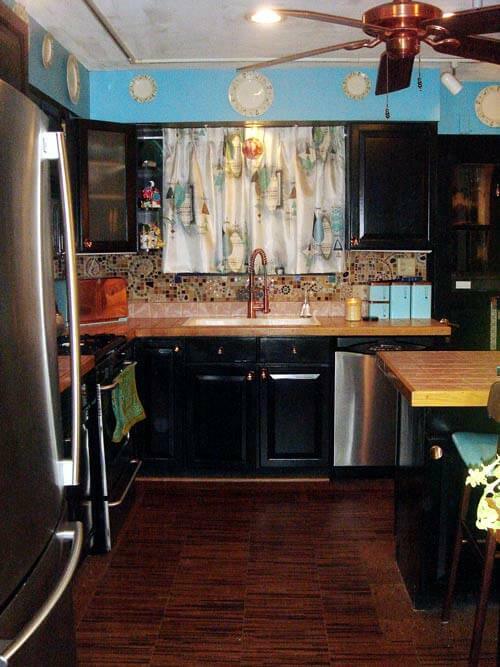 In the kitchen, the cabinets have been painted, a cork floor has been installed, we got new appliances (the hubby wanted stainless…compromise was needed), new (vintage) copper bullseye hardware, vintage window treatments and yes…the backsplash. So one weekend I decided that I would take a look at what I had in the box, decided to get a few more little glass dots, and mirrors and started gluing them to the wall. There wasn’t an overall plan, and I would just cut or break things as I needed them. The weekend stretched into a month, and by the time I grouted, two months but in the end, I love it, and that really is all that matters — isn’t it? 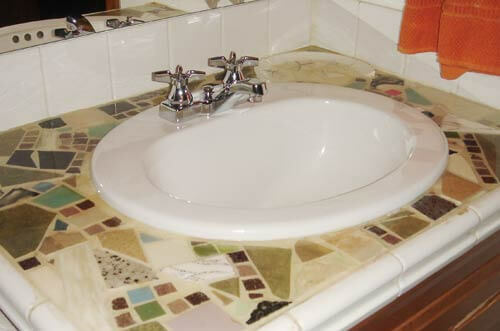 Believe it or not, I still had leftover pieces in my box, so the hall bathroom counter is Mosaic as well…. I will have to ponder the next mosaic project…. Maybe I will embed some in the concrete counter top when I get around to it. The kitchen isn’t done, not by a long shot. 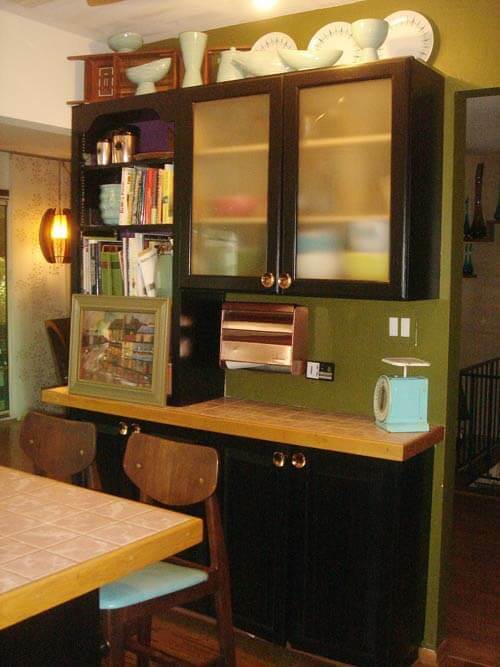 I still want flat front cabinets and weather they are new, used wood or metal, remains to be seen. If/when I do the concrete counter tops, I will most likely dip into the box of tile goodies in the garage again to accent it. I would LOVE one of the energy efficient magnetic induction ranges…. But there is no hurry, and as there is money and time, things get done. The house, patio and yard will never truly ever be done, it is always changing, morphing, evolving into something else…kind of a metaphor for life, isn’t it? I have been collecting mid century modern copper at least since the mid 90’s, and yes, there is no question it is harder to find than the more traditional copper. I think it just makes a sweet score that much sweeter! 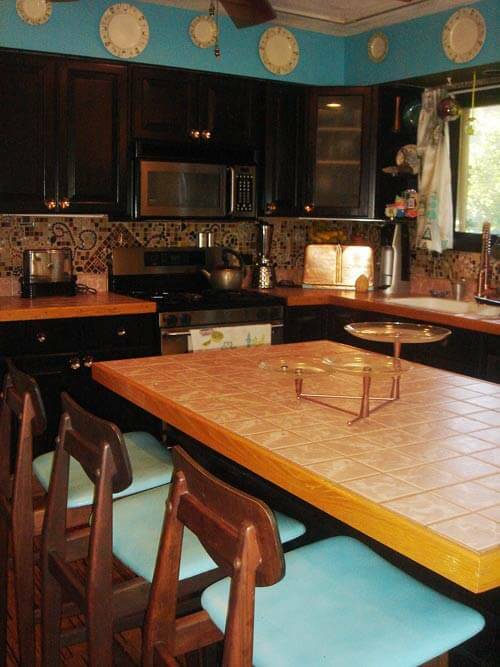 Yes, the cabinet knobs in the kitchen are copper…through e-bay, etsy, estate sales, garage sales the restore and second-hand shops we have found hardware, plumbing fixtures, light fixtures, small kitchen appliances and accessories for the kitchen as well as the rest of the house. Over the years we have also made things such as curtain rods, lamps, and various other things when we couldn’t find what we needed. 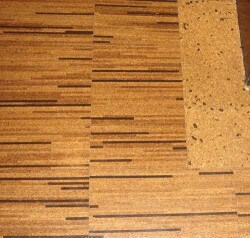 The floor in the kitchen is Expanko Cork Mosaic Thin Strip with accents of TerraLight 12 x 12 unfinished and un glued cork — which is kind of a pain to work with as you have to roll, roll, roll some more, weight, and roll the seams again to smooth them out. We found them at the ReStore for 50 cents a tile. The dining room table, as well as the coffee table, and the two living room chairs and ottoman, are Adrian Pearsall, assembled from e-bay and secondhand shops in the late 90’s. The dining room chairs, we never could find any info or marks on them. They also were from a second-hand shop in the late 90’s. 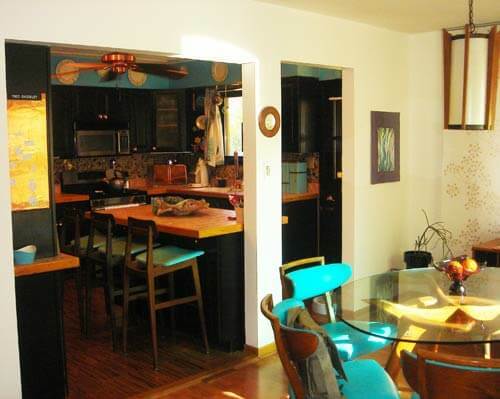 You may have more pictures of my dining room, as it was featured when Pam did the post on Cado systems. The Kitchen stools are Jens Risom from craigslist about three years ago. You should have seen the contortions needed to get 4 of them into the back of my VW Rabbit! 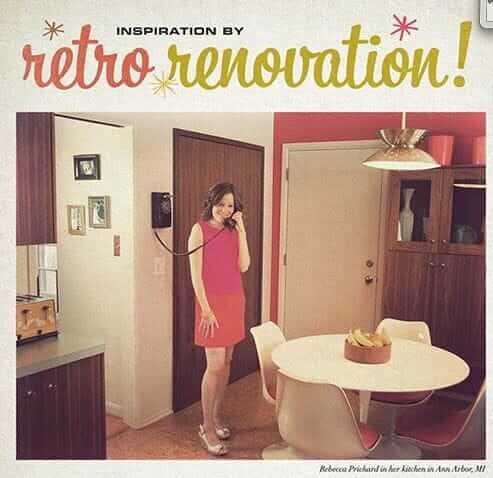 The Red Retro Shop on Etsy — her mid century furniture, accessories and clothing store. The Modern Red Studio Shop — where she sells her original art and photography. 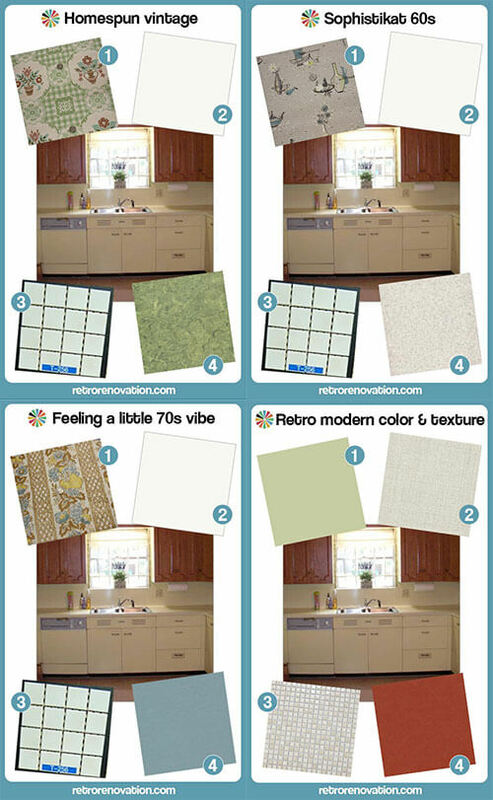 Redecorize — her redecorating and staging company. Wow Christa, you are one busy and talented lady — when do you find time to sleep? 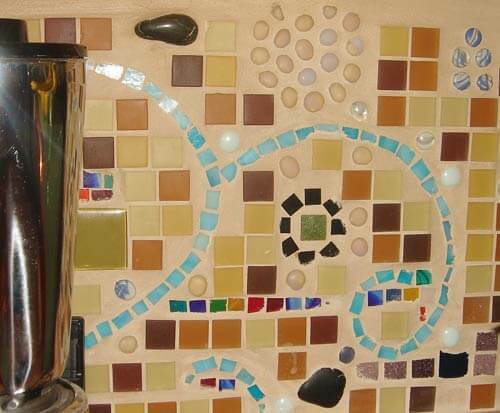 And your kitchen — I’m amazed by your ability to take so many different tiles and bits of stone and glass and make them one big cohesive looking wall mosaic. I’m also in love with your bathroom countertop — okay, I’m in love with your bathroom in general. 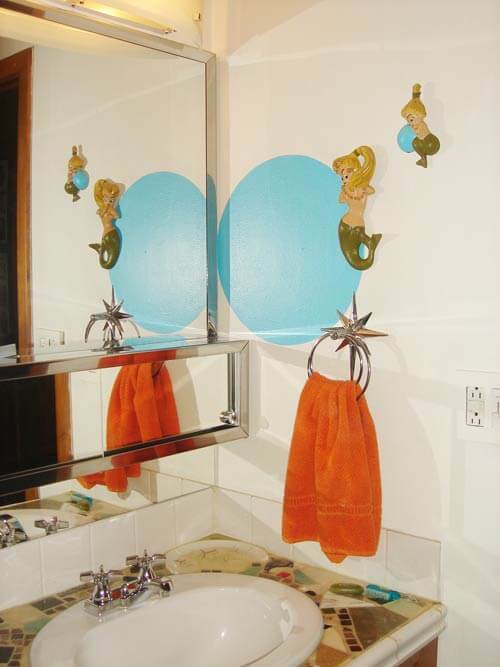 That starburst towel holder and the awesome retro mirror/medicine cabinet combo: Dreamy. 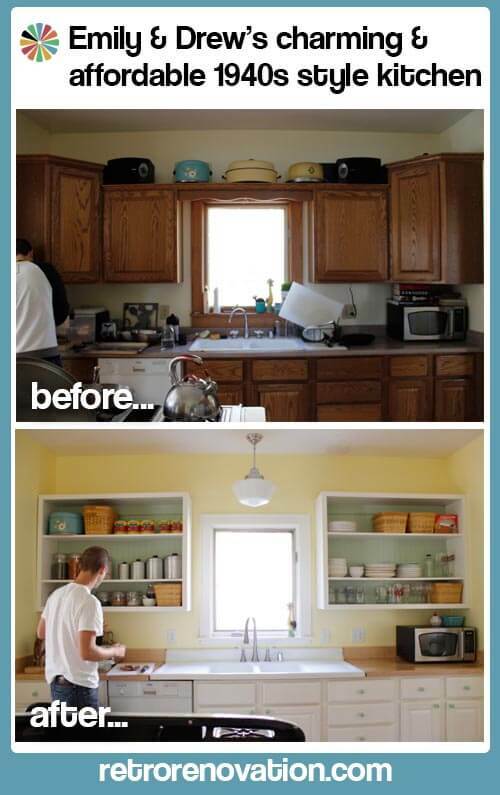 Mega thanks to Christa for allowing us to peek into her kitchen and bathroom! Would have like to see more of her coffee carafe collection. I enjoyed the peek at the copper banded coffee carafes on top of the cabinet and would have liked to have seen more of them. Sweet! Love pique assiette, fun to do, delightful to see. Check out this artist, a few of her pieces are mid century kitchen and lady of the house ‘paintings’ and they are amazingly wonderful. Cherry Pie, In the Fridge and The Soup Lady. 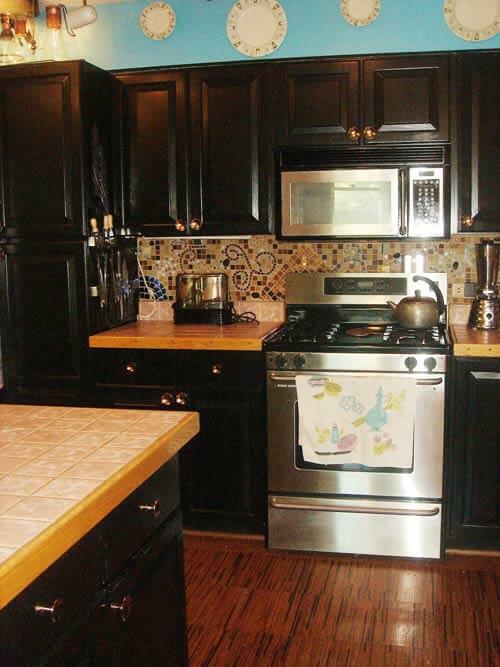 I absolutely love your tile backsplash, I do hope that you’ll reconsider replacing the tile countertops. 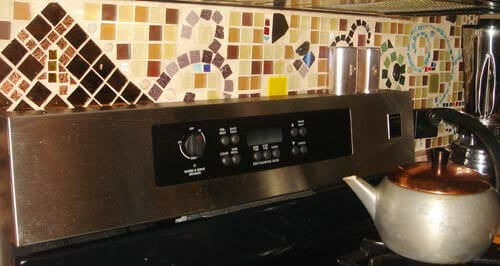 I think that the colors go very well with the backsplash, and at least from the pictures, it seems to be in good shape. I can understand the appeal of concrete, but at the same time, it is very ‘of the moment’. 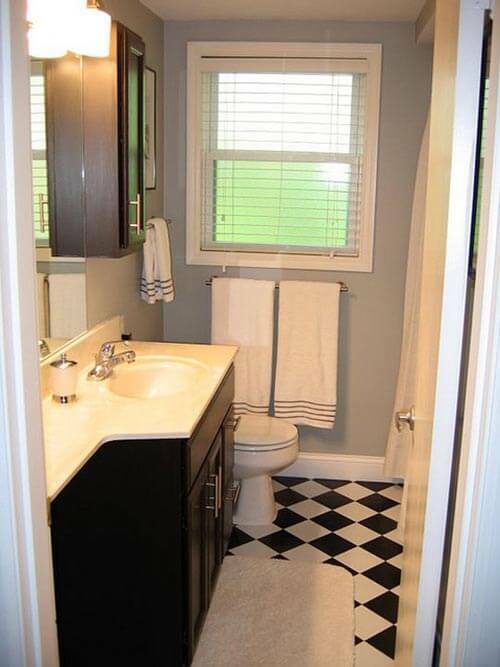 Not that there is anything wrong with mixing periods, and combining contemporary and classic touches, but at the same time, I’d be a little hesitant about replacing a timeless classic like tile with something that is likely to be more date-able.